Piper cannot hear Dumb’s music, but with growing self-confidence, a budding romance, and a new understanding of the decision her family made to buy a cochlear implant for her deaf baby sister, she discovers her own inner rock star and what it truly means to be a flavor of Dumb. How did I get this book: Bought it for my Kindle. Why did I get this book: Some good reviews around including a starred one from Kirkus. One of the things I love the most about Smugglivus is how I get to relax and catch up with my reads, with what I missed early in the year and then posting about it. Because one of the ideas behind Smugglivus is to simply celebrate books and reading and this is what I aim for with my reviews during this period – I try to post only about the books I enjoyed a lot, putting aside the ones I didn’t, for later. It’s like: for 11 months out of the year, I review all that I read, the Good, the Bad and the Ugly, no matter what. But for the duration of this one month, and this one month alone, I concentrate on the Good and nothing but the Good. 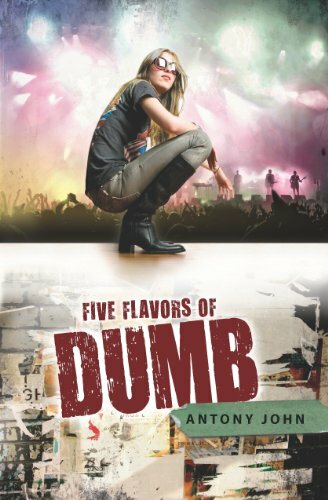 And Five Flavors of Dumb is really, REALLY good, surprisingly so – even though I heard nothing but praise for the book, I still didn’t expect it to be this good. It starts on the steps of a high school entrance this one morning with an impromptu performance by Dumb, the band who just won Seattle’s Teen Battle of the Bands. Although they are far, SO far from being “best” of anything, what they lack in talent they make up for in passion (at least some of them do). What Dumb really need is a Manager – someone to get them together, to make them rehearse, to guide them and well, to make them earn some money. Enter Piper: trying to get by unnoticed at school (as much as she can, at least), dealing with a pretty dysfunctional family, having to cope without her best friend (who left for a different High School), she just learnt that her parents used her college money to fund her baby sister’s operation and all of a sudden being the manager of a rock band sounds just like the thing to do and she is given one month to bring in some cash. This wasn’t a group at all. There was no togetherness, no blending – just five separate flavors of an indigestible dish called Dumb. But this is only the setup and there is a lot more to it. Life Lessons, Seattle, Hendrix and Cobain, passion for music and is all about and above all, great relationships in all forms: between girls (and all the girls are AWESOME, I can’t begin to tell you how much), between brother and sister even father – daughter and mother-daughter. Also, a sweet, sweet romance that had me rooting from the get go. I really loved how all characters are so different and complex. And the ending was SO freaking cool! And finally, of course there is the fact that Piper is deaf. That put me on guard before starting the book as I was worried that her hearing impairment would be the beginning and the ending of her characterisation. But being deaf is not what defines Piper as a character at all. It is of course part of who she is, how she interacts with the world and the people and a source of conflict especially amongst her family: her father’s horrendous lack of skill when dealing with Piper and avoiding sign language like the plague even though it’s Piper’s favourite way of communication. Speaking of language, I love how Piper observes how different people use the sign language in different ways to talk to her: some use it as a way to soften her up, because no matter what she always felt gratitude when someone uses it but also there are other characters who learn it as a way to show her how they respect her. Piper is an awesome character: she is smart and resourceful. But she is also a bit of a prick when the book starts, judgemental and even resentful of her baby sister and that makes her even more awesome because she feels like a real person, with all the good and bad, instead of a Pollyanna-type. It is easy to understand too, both her behaviour and also that of her parents – just imagine the situation they are in: three kids, one completely healthy, one whose deafness developed over time and one who is born deaf but who with an operation would no longer be. How to deal with all of it? It is a hard situation with no easy answers and I think that the author addressed it all really well. There is a caveat though: I say this without really knowing anything about hearing impairment, its limitations (or not), about hearing aids, and that needs to be taken into consideration. Piper is not A Great Deaf Character but a great character who is deaf. Notable Quotes/Parts: I loved this quote – and this whole sequence in the novel when Piper goes with her friends to get a new look. Be honest, though. Do you think I’m going to like this look a year from now?” She replaced the hairdryer in its holder with the utmost care. “Does it matter?” I thought about that for a moment. “Well, I guess I don’t want to believe this is just a stage, you know? That next month, I will wake up and say, ‘that’s not me at all’.” Cassie leaned forward like she was about to divulge a secret. “Honestly, one day you will wake up and say that and no matter what godforsaken mess Kallie ends up with today, she will too. And so will Tash, and everyone who comes in here. But you’re worrying about the wrong thing. Don’t worry about wanting to change; start worrying when you don’t feel like changing anymore. And in the meantime, enjoy every version of yourself you ever meet, because not everybody who discovers their true identity likes what they find. Woot! This makes me insanely excited that you enjoyed this book! After reading DUMB, anything Antony John writes is an instant-purchase for me. When I wrote about the cover on my blog, I wasn’t expecting on reading it any time soon, but when I got an ARC in the mail, the bloggers I normally follow weren’t reviewing it, and I wasn’t quite sure what to expect. So glad I was able to read it this year. It’s one of my top reads of 2010, for sure! I haven’t heard of this book before, but it heads straight to the top of my list, if only for that Kirkus line review. Thanks! I’m instantly drawn to a story about music and a deaf character. She may not be able to hear it, but she’s still experiencing it. Music is a language, just like sign language. This sounds awesome, no pun intended. Wonderful view – just added it to my TBR list because of it – will link to it in my news roundup tomorrow! Ah. This review just made me want to get this book NOW. I’d get the Kindle version but the cover is too pretty. Why is this taking too long to get in our country? Rawr. I didn’t expect to enjoy this one as much as I did. But WOW. I loved it. At one point I had to put on my Nirvana MTV unplugged CD. I’m buying this book for that quote alone. Fabulous.